In a career that spans more than five decades, John McLaughlin has honed a personal vision that transcends all boundaries, becoming one of improvised music’s most influential guitarists, composers, and bandleaders. 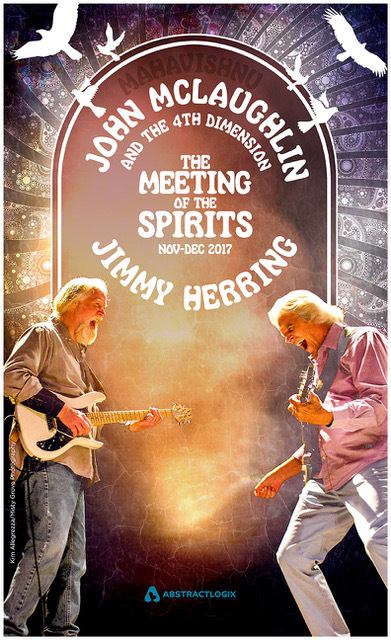 McLaughlin will be joined by the remarkable Jimmy Herring, who has been in the creative forefront of the thriving American rock-jam band movement for 25 years, for what has been dubbed The Meeting of the Spirits tour. Highlighting this musical adventure will be John McLaughlin revisiting the pioneering music he introduced with his deeply influential, genre-defying Mahavishnu Orchestra. McLaughlin will be backed by his current band, the 4th Dimension – Ranjit Barot (drums), Gary Husband (keyboards, drums), and Etienne M’Bappé (bass) – each an established composer and recording artist in his own right. Jimmy Herring, best known for his inspired contributions to the Aquarium Rescue Unit, The Allman Brothers, Widespread Panic, The Dead, and others, will be co-headlining each show with his own band. “Herring possesses the heart and soul of a rocker, the chops and harmonic awareness of a jazz artist, and the simpatico personality of a jam-band player,” according to Guitar Player magazine. 2017 also marks the return of Jimmy Herring as a bandleader since touring after his widely acclaimed Lifeboat (2008) and Subject to Change without Notice (2012).